This volume presents significant theoretical and practical contributions in the area of social media reputation and authorship measurement, visualization, and modeling. The book justifies and proposes contributions to a future agenda for understanding the requirements for making social media authorship more transparent. Building on work presented in a previous volume of this series, Roles, Trust, and Reputation in Social Media Knowledge Markets, this book discusses new tools, applications, services, and algorithms that are needed for authoring content in a real-time publishing world. These insights may help people who interact and create content through social media better assess their potential for knowledge creation. They may also assist in analyzing audience attitudes, perceptions, and behavior in informal social media or in formal organizational structures. In addition, the volume includes several chapters that analyze the higher order ethical, critical thinking, and philosophical principles that may be used to ground social media authorship. Together, the perspectives presented in this volume help us understand how social media content is created and how its impact can be evaluated. The chapters demonstrate thought leadership through new ways of constructing social media experiences and making traces of social interaction visible. Transparency in Social Media aims to help researchers and practitioners design services, tools, or methods of analysis that encourage a more transparent process of interaction and communication on social media. Knowing who has added what content and with what authority to a specific online social media project can help the user community better understand, evaluate and make decisions and, ultimately, act on the basis of such information. A chapter I co-authored with Itai Himelboim, Lee Rainie, and Ben Shneiderman, publishes the work we did in last year’s Pew Research Internet Project report on Mapping Twitter Topic Networks: From Polarized Crowds to Community Clusters. Now collected into a book, the report provides an overview of the basic social media network structures we observed in a large collection of network maps we generated from Twitter data. Business Analytics Forum hosted by the Business Analytics and Statistics Department at the University of Tennessee on April 20, 2015 will feature a talk on social media network analysis using the free and open NodeXL add-in for the popular Excel spreadsheet. The Social Media and Web Analytics Innovation conference is taking place on April 29 and 30th in San Francisco. 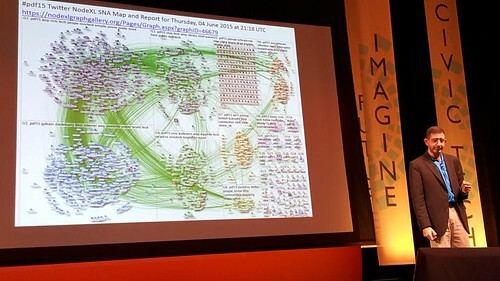 There will be a talk about the ways social network analysis can be applied to social media. 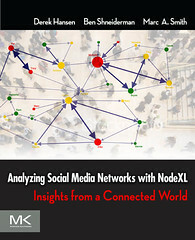 Using the free and open NodeXL application, it become as easy as making a pie chart to make a network chart and report.